The lovely people at Waterstones in Bedford have allowed me to take over a small part of their shop this Saturday 30th November so I can sign books. I will be in the shop from about 10:45 onwards with copies of all 4 books in the Courts of the Feyre series available – at least until we sell them all. To tempt you to come along, I will be giving away a free signed copy of Sixty-One Nails to the first five people who come into the shop and give me the codeword, “DOGSTAR”. Come early because they will go quite quickly. In any case, come along and say ‘Hi’. If you want to bring along your existing copies, I will be glad to sign those too. Bear in mind that I will be sporting my Movember Moustache in all its glory. On Saturday 12th October I will be at Wood Green Literary Festival, along with Anne Lyle, author of the Night’s Masque series, and together we will be discussing Mad and Magical London – the London of the unknown and the unseen, and the London of magical and mysterious history. 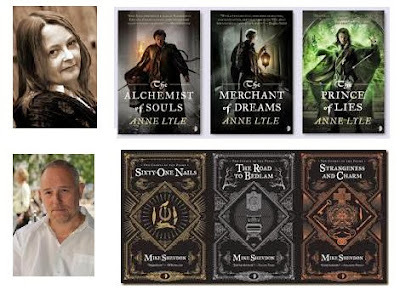 Anne and I will be happy to sign books, or just chat about London, fantasy, writing and books. Latest information is that we will be in Wood Green Library, but that may change, so keep an eye on the festival website for latest information. And you get me into the bargain, talking about The Courts of the Feyre and writing in general. I will also be around to sign copies of the books, including Strangeness and Charm – all supported with free cake from The Harland Cafe and with books on sale from The Space Centre. If that wasn’t enough to tempt you,the Angry Robot editorial team will be there, talking about publishing, what it takes to be an Angry Robot Author and how to get that big break. The event starts at 1pm at Sheffield Central Library, but remember to get those tickets in advance. This coming weekend of Saturday 9th and Sunday 10th October, Newcon 5 will take place at it’s old venue in the Fishmarket in Northampton town centre. It had to be postponed last year because of uncertainties about the venue, but I am delighted that it’s back this year stronger than ever. The guests of honour are Paul McAuley, Pat Cadigan and Paul Cornell and there are loads of other authors attending along with fans from all over the country. I shall be reading at 11:00 on Sunday along with Juliet E McKenna and Keith Brooke, of which my only regret is that I shall miss the panel with Paul McAuley talking about Space Opera. It looks like a great weekend, and if you’re coming along, please do come up and say Hi. Newcon is a wonderful place to meet authors and we don’t bite. Well, most of us don’t. The equinox has come and gone and spring is definitely upon us. You can tell this by the snow outside. Spring means Easter, though, and that means Eastercon, which is being held at the Radisson Edwardian Hotel near Heathrow this year. Odyssey 2010 is probably the largest and most comprehensive con in the UK and covers the full range of media, films, TV, comics and of course, books. The program spans from Good Friday through to Easter Monday and is available here. The Guests of Honour are Alastair Reynolds, Iain M Banks, Liz Williams and Mike Carey, which is quite some line-up. Open Autograph Session. 12pm-1pm. Hotel Lobby. Lots of our attending writers will be present to sign your books. Joe Abercrombie, Aliette de Bodard, Chaz Brenchley, Mike Carey, Mike Cobley, Paul Cornell, Stephen Deas, Jaine Fenn, Colin Harvey, Roz Kaveney, MD Lachlan, Claude Lalumie?re, MEG, Ian R. MacLeod, John Meaney, Ricardo Pinto and Liz Williams, Suzanne McLeod, Mike Shevdon. The Occult in Modern Urban Fantasy. 6pm-7pm. Room 12. Modern urban fantasy is strongly influenced by the occult. Why is the occult such a rich source of stories, and how do you keep your characters authentic but uncliched? Mike Carey, Suzanne McLeod, Mike Shevdon and Pat Rigby-McMurray (mod). London as an SF/F Setting for Books, Comics and TV. 7pm-8pm. Room 12. From Doctor Who to Neverwhere to Stickleback in 2000AD, London has made many appearances in Fantasy and SF (and even as board games). The panel discuss the different ways in which the capital has been portrayed. Sebastian Bleasdale, Mike Carey, Roz Kaveney, Pat Rigby-McMurray (mod) and Mike Shevdon. If you’re planning to be there, do come and say hello, either at the Open Session, after a panel, in the bar or wherever. There are loads of other sessions to go to and lots of great writers will be attending, either as guests or simply to enjoy the con themselves. Reviews and reviewers are both the saviour and damnation of writers. Without reviews, our work will go unnoticed and our efforts unrewarded, but like a two-edged sword, it cuts both ways. Last year, Angry Robot Books held a launch party at Forbidden Planet in London, which was great fun, thanks to the efforts of all concerned. It was strange for me, though, because I didn’t have anything to promote other than myself. My debut novel was still a couple of months from publication and the best I could offer was an ARC or two and there were no-where near enough of those to go around. In a way, though, it was liberating as it freed me to chat to visitors and authors alike and made for a most engaging and enjoyable afternoon. So, when someone sidled up to me and asked, “Have you had your first reviews yet?” I was slightly taken aback. I explained that the book had only just gone to the printers. “You wait,” he said, in a manner of someone watching storm clouds bank up on the horizon. He proceeded to quote a review he had received for a piece of his own writing, at length, word-for-word. The comments were fiercely critical, vindictive and insulting. “You always remember the bad ones,” he whispered to me. It was a strange comment to make at a launch party and the debut of a writing career and it struck me that he was carrying these comments around in his heart and that periodically, like a penitent monk, he would pick up the review and beat himself with it. Whether this was an incentive to improve his writing, or a way of dealing with his own insecurities I do not know, but I resolved not to carry bad reviews along with me. I would leave them behind me and move on. Since then I have been fortunate enough to be blessed with some very positive reviews, but I have also learned something about the nature of reviews themselves. The truth is that when you release a story into the wild, something strange happens. The characters that you invented, the situation that you placed them in, is recreated in someone else’s head and what used to be yours becomes theirs. This is fundamental to the suspension of disbelief and, as an author, you rely on this to support your narrative. What you imagined, though, isn’t what they see, so what they are reviewing is not what you imagined. It is coloured by their experience and tinged with their memories, prejudiced with their loves and hates. As an author, I don’t think that you can ask more from a reviewer than to ‘get’ what we are after. If the reviewer liked or disliked the book, if it horrified or amused them, caused them to stay up late or throw the book at the wall, that is down to their personal experience of the book. They have made the effort to place themselves in an open state of mind that was receptive to the authors imaginings. In contrast, as authors, it is down to us to set out those imaginings in such a way that it doesn’t matter whether the reader has comparable experience or even knowledge of the situation. It is our role to create that situation for them so that they may experience it for themselves. If we can achieve that, then the reviews that follow will be as glowing as the one mentioned here.